SWITZERLAND, Zurich — Based on breaking news and events, it appears that the CIA Headquarters beneath Lake Geneva is preparing to execute a wave of Islamic terror attacks in France. 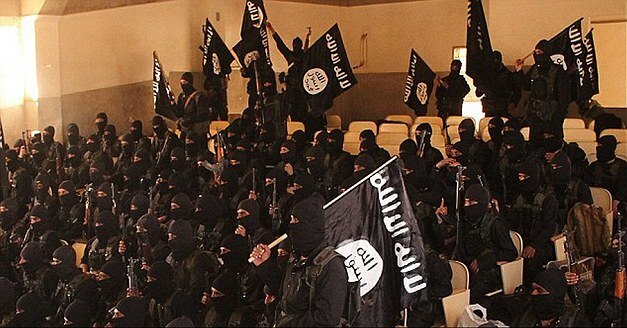 Said attacks will most likely be blamed on the state-sponsored terror group known as ISIS. That being said, ISIS-inspired and/or Neo-Nazi-related attacks on asylum seekers/refugees in France, and/or or terror attacks in France by Islamic terrorists posing as asylum seekers/refugees also now appears to be in order. In what appears to be one of the slated French terror targets, it was reported back on October 19, 2015, that the Eurotunnel was shut down for 4-hours after hundreds of migrants stormed the terminal in France. Consequently, the tunnel and/or the asylum seekers and refugees may be targeted. Whether the timely shut down of the Eurotunnel provided the necessary cover for the installation of weapons and/or explosives is not known, but it’s highly likely. Said weapons and/or explosives could utilized at a later date in a coordinated state-sponsored terror attack. In what appears to be pre-French terror attack propaganda, it was reported back on March 23, 2015, that France now faces an “unprecedented” terror threat. Translation: the Swiss CIA is now preparing to execute a fresh wave of terror attacks in France. Exactly what type of terror attacks are now in play for France is not known, but attacks on French airports, landmarks (e.g., Eiffel Tower), nuclear reactors, trains and schools are the most likely. That being said, it now appears that a 9/11-style attack by Malaysian Airlines Flight MH370 may be imminent. 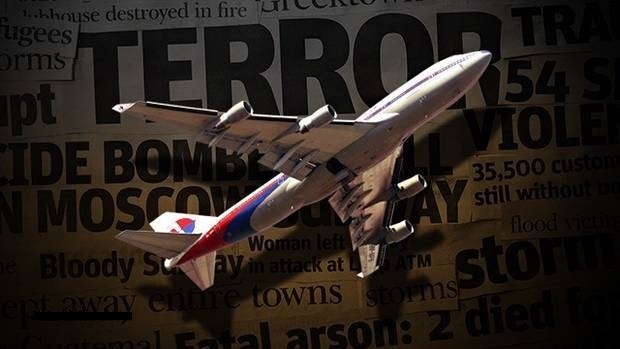 As reported ad nauseam, the previously hijacked Flight MH370 which was disappeared by the CIA back on March 8, 2014, explicitly to execute a WMD-related attack and/or transport hundreds of ISIS terrorists from Iraq, Jordan and Syria to a western country such as France. 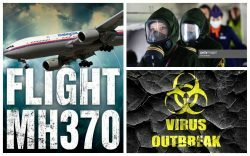 The notion that Flight MH370 is on its way to France was foreshadowed back on August 1, 2015, when it was reported that the washed-up wing flap of what was purported to be Flight MH370 arrived in France for investigators to study. Needless to say, the real Flight MH370 may arrive in France at a later date. Two after Truther.org published a report on August 20, 2015, entitled “CIA Plotting Wave of Islamic Terror Attacks in France, Namely Paris”, it was revealed on August 22, 2015, that 2 American Special Forces subdued an Islamic gunman on a high-speed train in France. The Islamic terror suspect was evidently the slated gunman in the Gaza Beach Protest Terror Plot and was followed and subsequently apprehended on the train once the respective plot was foiled. The notion that the men stopped an attack was a CIA publicity stunt designed to raise the specter of terrorists on French trains just prior to a staged attack. In order to foreshadow Islamic terror in France, Russia Today published a report on August 23, 2015, entitled “Known Islamists Must be Expelled from France, Le Pen Says after Train Attack”. The timely comments by La Pen were designed to infer that Islamists are still in France just prior to another attack. Roughly a month later on September 25, 2015, it was reported that a night guard was arrested in France after photocopying jihadist papers. 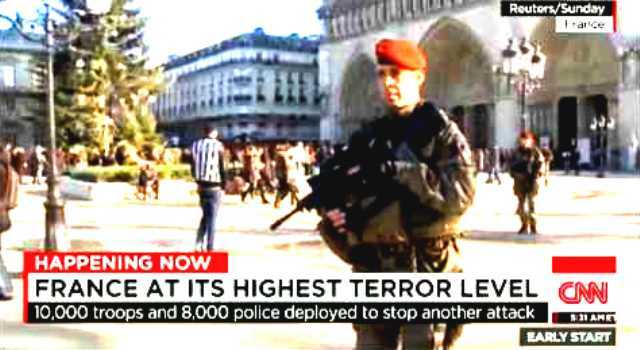 Needless to say, the incident was fabricated by the CIA in order to foreshadow Islamic terror in France. In order to provide a timely motive for ISIS-related terror attacks in France, it was reported on September 28, 2015, that France launched its first airstrikes against ISIS in Syria. Considering that CIA created ISIS as cover for nuclear and biological terror attacks, the airstrikes likely never transpired in reality. Lastly, a day later on September 29, 2015, it was reported that a Nazi banner was unfurled in France for a World War III film. The publicity stunt was evidently designed to foreshadow the notion of Nazi-related terror in France just prior to a Neo-Nazi attack on asylum seeker and refugees. 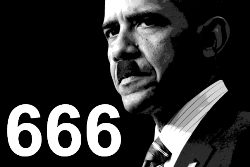 Based on breaking news and events, it appears that CIA Headquarters beneath Lake Geneva is plotting a wave of terror in France, namely: a) ISIS-inspired and/or Neo-Nazi-related attacks on asylum seekers/refugees in France; and/or or b) terror attacks in France by Islamic terrorists posing as asylum seekers/refugees. Exactly what type of asylum seeker/refugee terror is in play for France is not known, but attacks on asylum seeker/refugee-related apartment buildings, buses, government offices immigration centers and tent camps are likely now in order. Regardless of who is ultimately blamed for the impending terror in France, the attacks will provide a timely motive for CIA minions within European governments to drastically alter EU asylum and immigration law, especially in respect to the Dublin Regulation which governs EU asylum law, namely in Switzerland. Considering that I, David Chase Taylor officially applied for political asylum in Switzerland on July 17, 2015 and have yet to receive a single appointment (a violation of the Dublin Regulation), it now appears that the refugee crisis in Europe is being orchestrated by the CIA in order to drastically change Swiss asylum law so that my case will never be heard. In what appears to be pre-French terror attack propaganda, it was reported back on March 23, 2015, that France now faces an “unprecedented” terror threat. In other words, the CIA in Switzerland is preparing to execute a wave of terror attacks in France. In order to provide a timely motive for ISIS-related terror attacks in France, it was reported back on April 21, 2015, that Syrian President Assad stated that France is supporting “terrorists” in Syria and is acting as Washington, D.C.’s satellite in the region. A day later on April 22, 2015, French police foiled an ‘imminent’ church terror attack. Less than 24-hours later, France foiled five more terror attacks. The foiled attacks were evidently fabricated in order to give French officials plausible deniability in the wake of a horrific school-related terror attack. In what may be the slated Islamic terror patsies who will be arrested and scapegoated for the impending terror attacks in France, it was reported on April 23, 2015, that France is still searching for accomplices in the allegedly foiled church terror attacks. Consequently, Islamic terrorists are now on the loose in France. In order to sell the notion that the French government is doing all that it can to stop Islamic terrorists just prior to a horrific attack in which score of French citizens are sacrificed, it was reported back on May 5, 2015, that a controversial surveillance (spy) bill became law in France. Roughly 6-weeks later on June 26, 2015, a man was reportedly beheaded at a gas factory in France, foreshadowing a possibly bio-chemical terror attack in France. In what appears to be pre-French terror programming, it was reported on June 27, 2015, that France is “on edge” a day after its second terror attack in 6 months. Needless to say, a third and fourth terror attack in France appears imminent. Lastly, it was reported on August 22, 2015, that 2 American Special Forces subdued an Islamic gunman on a high-speed train in France. Needless to say, these reports, taken collectively, suggest that a state-sponsored terror attack in France is imminent. Back on May 21, 2014, Truther.org issued a terror warning in respect to an impending attack on the 2014 Cannes Film Festival in Cannes, France. Less than 24-hours later, it was revealed that the missing British yacht which was evidently hijacked for the attack on Cannes was suddenly found. The timing of the report was curious considering that the search for the missing vessel was officially called off roughly 72-hours prior. Regardless, three days later on May 24, 2014, a total of 3 Special Forces were executed in Brussels, Belgium as part of the Terrorgate Scandal. Although a total of 4 commandos were targeted, one of them managed to escape. After a weeklong nationwide manhunt, French police finally arrested Mehdi Nemmouche (29), on June 1, 2014. 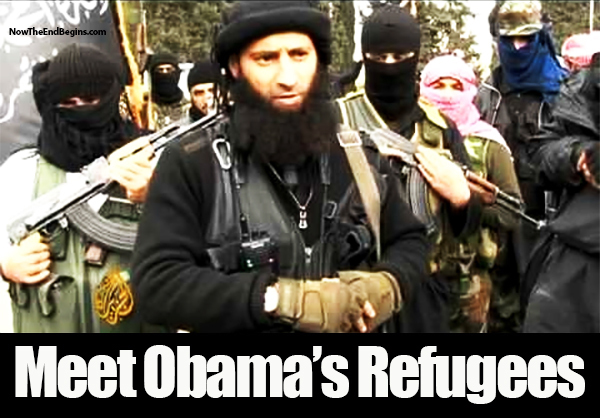 Coincidentally, Nemmouche recently spent a year in Syria training, fitting the Cannes terrorist profile perfectly. In order hide the fact that this was in fact a mass execution, it was reported that the attack was “anti-Semitic” in nature and that two of the victims were female. Aside from Nemmouche, the names and photos of the other killed have not been released to date.